It’s a race to the Kickers soccer league play-offs. Nine-year-old Ben is pretty sure that if the Bobcats win two of their last three games, they’ll earn a tournament spot. But in their game against the Tigers, the Bobcats are a mess on the field—they’re not passing well at all—and Ben decides to take control. Someone has to win this thing, and his teammates just aren’t measuring up. Then the whistle blasts, the red card waves, and Ben is out—benched for dangerous moves. Not only that, he’s barred from the next game, too—a key bout against the Rabbits. How can he possibly help his team to the play-offs from the sidelines? 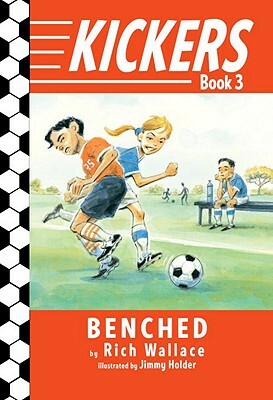 The Kickers series, from award-winning sports novelist Rich Wallace, features nonstop soccer action, black-and-white art, and league statistics and soccer tips throughout. Rich Wallace is the acclaimed author of many books for young readers, including Sports Camp; Perpetual Check; Wrestling Sturbridge, an ALA-YALSA Best of the Best Book for Young Adults; Shots on Goal, a Booklist Top 10 Youth Sports Book; and the Winning Season series. He coached soccer for several years, beginning when his older son joined a team in kindergarten.